She even bathes in his water bowl. Now, Rex is paying that kindness forward - and there's one tiny bird who clearly loves him for it. That's when they met Hummer, in poor health but still clinging to life. Rex's concern for the bird convinced Gernon to try to help her. "It was this little creature," he told CBS Los Angeles. "This fragile creature that the whole world wanted to kill and he was trying to protect her so I thought I'd go the distance." 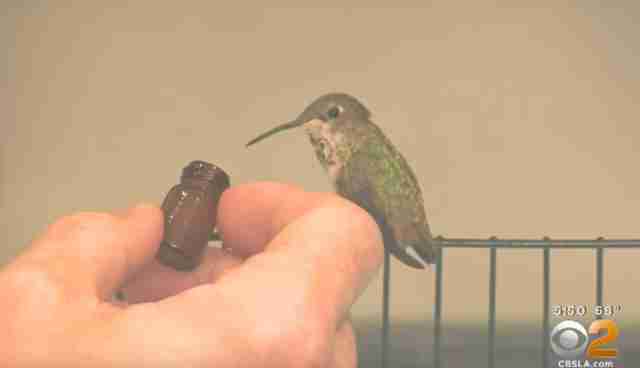 Over the following weeks under Gernon's constant care, little Hummer regained her strength and was soon flying - though seeing the remarkable trust she has in Rex suggests she remembers the role he played in saving her. Here's video of the two of them interacting. In fact, Gernon says that Hummer "developed a total crush on Rex" - preferring never to leave his side. "Wherever he was, she wanted to be close by," he wrote on YouTube. "She even started bathing in his water bowl, killing time while he ate before she'd start playing with him again. So strange, but amazing." While the hummingbird's fancy for her canine hero is indeed remarkable, Gernon expects that as Hummer matures she'll set her sights on a more fitting mate. But until that day comes that she chooses to fly away, they'll keep on basking in the happy fact that their acts of kindness have come full circle. "I rescue this dog. He rescues the bird," Gernon told the news station. "The bird rescues all of us in a weird sense and it's just a miracle."